Canker sores hurt as you might know if you have ever experienced them. My mom always used Alum powder to stop the pain but I can tell you from experience that it hurts like &8!2 when applied. Spencer had a canker sore a few months ago that was quite red and sore. I had received a free sample of CankerMelts in the mail and decided to give them a try. We placed one on his sore, Spence said it stung a little, it stuck to the sore, started to dissolve and the pain was going away. He slept with the melt overnight and was thrilled to report that his canker sore no longer hurt! I was really impressed and soon would find myself trying the melts. Accidentally I cut my gum brushing my teeth a few weeks ago. I located the CankerMelts at Walgreens and purchased them to see how they worked for me. Popped on before I went to bed and by the next morning my canker sore was much better. I put another melt on and by the time it had dissolved the pain was totally gone. These items really do work and work very well! 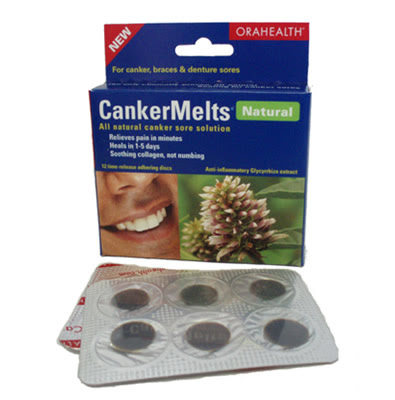 The melts are all natural, easy to use and will help anyone who is suffering from a canker sore. You can receive a free sample by clicking here, check out the CankerMelt website for more information and where to purchase.